Out O Sight Mole Trap by Victor 0631. Spring-loaded mole scissor trap. 12/case. Features malleable iron jaws for superior strength and durability, setting tools are included. 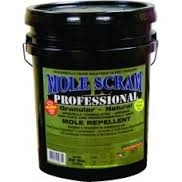 Mole Scram has been proven to quickly and effectively reduce and eliminate mole activity! Triple-Action Protection Against Moles: Bad Taste -- Makes moles' food hard to digest; Bad Smell -- Strong to them, but mild to us; Less Food -- Reduces insect population on the ground.